Johannes ‘ John ‘ GERITS A.P.M. Stations: Country NSW, Gloucester & Lord Howe Island 1999 – ? Passed away at home comforted by his loving family on the 13th November 2014. Much Loved husband of Carmel. Loving father and father in-law of Michael & Kate, Cindy (dec), Fiona & Terry. Proud and adoring POP to Molly, Lloyd, Jessie and Jack. Cherished brother and brother in-law of Carolina & Henry, Anne & Neil, Yvonne & John (dec), Trish & Don, Barbara & Kevin, Maree & Robert. Loving uncle to his No 1 favourite nieces and nephews. Relatives and friends are respectfully invited to attend John’s funeral service to be held at The Holy Name of Jesus Catholic Church, Forster on Tuesday 18th November 2014 commencing at 11.00am, Prior to a private cremation. ATTENTION: Funeral location has now changed to Tuncurry Catholic Church, Foster, same time. Sadly we have lost another colleague formerly in blue. Johannes (John) Gerits passed away this morning at home after a battle with cancer. John worked almost all of his service in NSW country locations with his last two being Gloucester and Lord Howe Island. He will be sadly missed. A Good man. July 9, 2002, 8:50 p.m. THE local knowledge of a Port Macquarie senior constable may have been responsible for saving the British destroyer HMS Nottingham from a major catastrophe. Senior Constable John Gerits, who heads the one-man police unit on Lord Howe Island, was the first person to come to the ailing ship’s assistance after it ran aground on Wolf Rocks, several kilometres off the East coast of the island. After receiving the ship’s distress call at 9.50pm on Sunday night, Sen Constable Gerits immediately coordinated a rapid emergency response which may have prevented the 3500-tonne navy vessel with a crew of 250 from sinking. “I just got on the phone and called anyone on the island who I thought would have a pump which could be used by the ship’s crew,” Sen Constable Gerits said. Until the four pumps arrived on the ship, crew aboard the Nottingham only had access to buckets as they desperately tried to empty several flooded compartments. The pumps, which collectively siphoned 5000 litres an hour, managed to keep the ship afloat for more than seven hours until the Royal Australian Air Force arrived with heavy-duty pumps on Monday morning. “When we first responded to the distress call we truly didn’t know if the ship was going to sink. It was absolutely frightening,” Sen Constable Gerits said. Sen Constable Gerits said the department of defence had taken over rescue efforts but he and other Lord Howe residents were still helping by providing the ship’s crew with fresh water and clean laundry. British salvage experts are currently examining the HMS Nottingham, which is anchored at Lord Howe’s Middle Beach. Commander Richard Farrington, who was in charge of the ship at the time of the accident, said the accident occurred as the ship maneuvered to put a helicopter into its hangar. The president of Coffs Harbour Community Transport, John Ruth, is among the people recognised in today’s Queen’s birthday honours. Mr Ruth of Sandy Beach has been given a Medal of the Order of Australia for services to the community, particularly those with disabilities. But he says the award recognises a contribution by the community for a service that is desperately needed. “Government services especially. People in DOCS [Department of Community Services] and other agencies who have really given enormous support to the activities of volunteers. We’re still very much in our infancy in organising services to support people with a disability,” he said. [blockquote]The state’s most remotely located police officer has been nominated for an Australian Police Medal as part of the Queen’s honours list. Lord Howe Island’s only policeman, Johannes Gerits, is one of eight officers who have served 25 years or more to get the nomination. 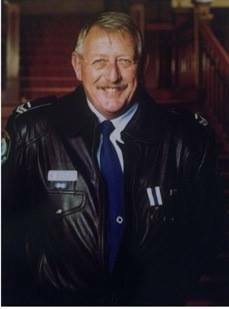 Senior Constable Gerits has been a policeman since 1971, and took up the posting at Lord Howe in 1999. Other recipients of the Order of Australia Medal include Anne Bornstein of Harrington, who will receive her medal for her community service through the Franciscan Missionary Union. Joyce Davey of Taree is being honoured for her cancer action group work in the Manning. Husband and wife team Kevin and Mary Dunkley’s service to the north coast through the Trial Bay Royal Volunteer Coastal Patrol is being recognised, along with William Radford from Taree for his service to veterans and their families in the Manning. The late William Wright, of Nambucca Heads, is being recognised for a range of community deeds in the Kempsey community. A special OAM was presented by Governor Marie Bashir to Bellingen councillor Sue Dethridge at a bedside ceremony in a Sydney hospital during the week.